100% READY FOR YOUR LENSES. 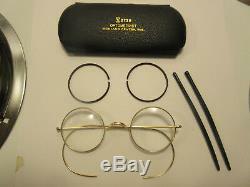 John Lennon of the Beatles owned several pairs of these awesome, iconic eyeglasses. You wanted the best and now you've found THE ABSOLUTE VERY BEST!! As you can easily see, the frames come with a " New Antique Stock " Signed A. (American Optical) case (unused), the original Zylonite Rim Covers, that can be removed and carefully snapped back into place as in my photos and the very soft, black, special silicone Temple Covers, that are easily removed and can be held snug by adding clear silicone glue to the curled portion on the Temple Stems. Any excess silicone glue can be easily wiped clean with a warm disposable damp cloth. Even though silicone glue can be used. The covers will still come off after gluing by tugging and twisting. The left over, dry silicone glue, if any, will wipe off the gold stems very easily. I totally recommend using the Temple Covers as it seals the curled, cabled portion from amino acids found in human sweat and can extend the life of the stems by decades. They'll also add the utmost in comfort. The frames will arrive to you without the Temple covers and Rim covers attached unless you specify otherwise. The back of the bridge is clearly stamped with the American Optical logo of the era, is actually signed "WINDSOR" and hallmarked for gold content with the 3/4 rectangle with tiny "o" in the center. My last photo is an accurate design of exactly what is stamped on the back of the bridge. Make no mistakes folks, these are 100% authentic. Manufacturing Windsor frames ended in the year 1910. 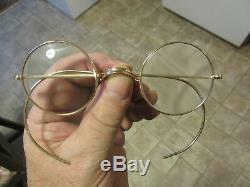 These are sometimes referred to as "Patented Windsor Eyeglasses". Please keep in mind, patents do not determine the exact age of any given item and in this case, the frames were manufactured much earlier, as the patent was not granted until the year 1922, way after production of these Windsor eyeglass frames ceased. These eyeglasses were made in the year 1889. The frames measure 4 5/8 inches from hinged edge to hinged edge. 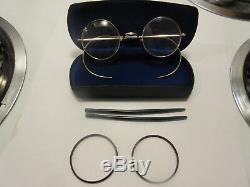 The rims are 40MM, considered perfectly round and exactly the same as John Lennon wore. The bridge is set at 22MM. The beautiful, original, cabled temple stems are 6.5 inches in total length and will fit most medium to large adult Men or Women. Drop one of those tiny screws and they're gone forever and not easy to replace unless you know someone like me. My labor is 100% FREE. To do so would be quite ludicrous, as to be in actual mint condition, they would have to be encapsulated like a coin and untouched by any hands ever. 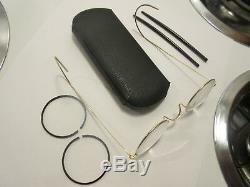 These eyeglass frames have been used, albeit "very lightly used". The best and honest way to describe these is in "Honest, True, Excellent ++ Condition" despite the fact they are well over 100 years old and very ANTIQUE. The Metal and some History. The frames are made of 1/10th yellow gold filled. Gold filled is a heavy bonding of solid gold and in this case over brass. The 1/10th means that the total weight of the gold used to make these must weigh at least 10% of the entire weight of the metal. Many folks have found that these often produce much more gold, in scrap, than what is reported or stamped on the back because the gold was applied by hand in ribbon style form, much the same way thread is spooled onto the eyes of a fishing pole. I've seen yields of gold over 15%. They were manufactured in the year 1889. 1889, was the very first year they were signed / stamped on the back with the word WINDSOR. The exact position of where the bridge arms attach to the rims also determines the year of manufacturing. You think I've done enough research? No one, on this planet, has researched these iconic frames any more than myself. 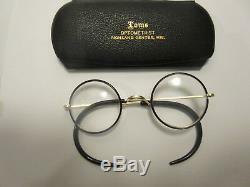 Please read on and learn.. American Optical had its highest production years in 1880, 1885, 1889, 1905 and 1909. It took 27, different skilled craftsmen to make them. 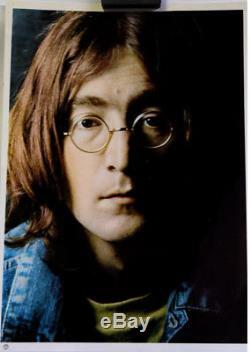 In the photos of John Lennon above, John was actually wearing Windsor frames with the Convex style saddle bridge. Be advised, John Lennon wore both styles, including the concave variety, and either of them are considered authentic to John Lennon. The Fame and additional History. 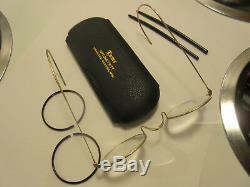 According to Yoko Ono and Sean Lennon, John Lennon owned over 40 pairs of gold, wire rimmed eyeglasses. These frames were also made famous and were worn by Teddy Roosevelt, Ernest Hemingway, Joseph Stalin, Winston Churchill, Mahatma Ghandi, Groucho Marks and even David Letterman, Whoopee Goldberg, Sting and Ozzy Osbourne wear these same frames, along with a slew of other famous rock musicians. 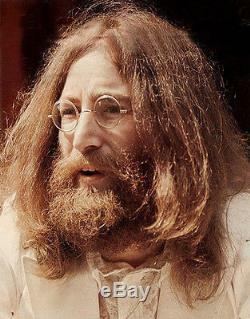 Everyone felt John Lennon was trying to make a fashion statement, when he first started wearing gold wire rimmed eyeglasses, late in the year 1966 but the truth is, "he fancied the way the curled, cabled stems wrap around his face" and would not fall off or even shift. They're highly sought after by both avid Beatles collectors and antique eyeglass dealers, musicians, motorcycle and horse riders. I love them for fishing and picking weeds in the garden. When they are as exquisite as these, they can command a much higher value as well. It simply does not get any better than this PERIOD. 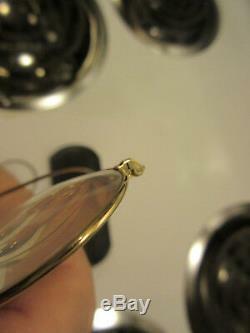 These eyeglass frames will not need to be cleaned or polished for a very long time. With my used frames, the lenses are removed to completely to clean and polish the bezels, which is vital to obtain a solid fit when installing new lenses. No dirt, no grime, no tarnish, no corrosion anywhere on this pair of truly antique beautiful spectacles. They also tend to make heads turn and I'm often asked about them when I'm wearing mine. They're awesome folks and look great on both female or male adults and children alike and are also the exact same used in the Harry Potter trilogies, however the rims on Harry's, were covered with an era specific, special plastic called "Zylonite" or just plain "Zylo". 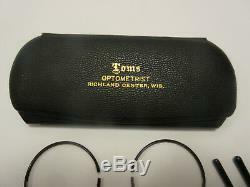 These eyeglasses come with a very handsome, steel / hard antique eyeglass case, that's "Era Specific", is a true New Antique Stock (unused) and is signed / stamped A. The frames and case were STORED PROPERLY over the many years and came from a lady in West Virginia, who is a retired optician and who's father, grandfather and great grandfather were also opticians. Four generations of opticians and these were part of her great grandfather's collection. It can be mega difficult to find an "era specific" case, such as this one, in true, unused near mint condition. The gorgeous royal blue felt interior looks stunning as well. These frames are more popular than ever... I'm talking about THE REAL THING. Even those that have John Lennon's name engraved or embossed on them are not authentic and quite inferior to these. I'm still pinching myself.. I'm happy to present to you, a genuine pair of American Optical manufactured and signed WINDSOR eyeglass frames in TRUE EXCELLENT++ CONDITION! I've lowered my costs and folks have been pounding it often. Check my feedback and see for yourself. The item "BEATLES JOHN LENNON ANTIQUE VINTAGE GENUINE SIGNED WINDSOR EYEGLASSES EX++ COND" is in sale since Thursday, February 7, 2019. 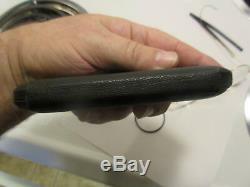 This item is in the category "Clothing, Shoes & Accessories\Vintage\Vintage Accessories\Eyeglasses". The seller is "asylumrockmusic" and is located in Spokane, Washington.